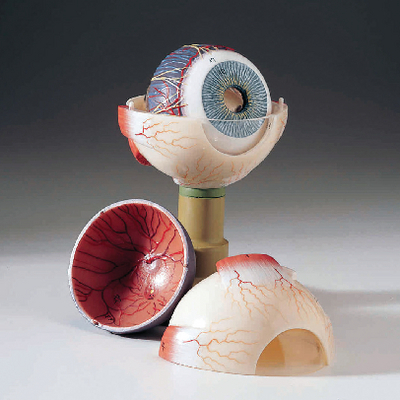 Enlarged four times, with six removable parts, the detailed model provides a great picture of the overall structure of the eye and the interrelationships of the individual components. The sclera is sectioned horizontally to show attached ocular muscles and vessels, and the choroid is medically sectioned to show the retina, ora serrata, and optic nerve. Removable parts include the two-part sclerotic membrane, vitreous humor, and lens.